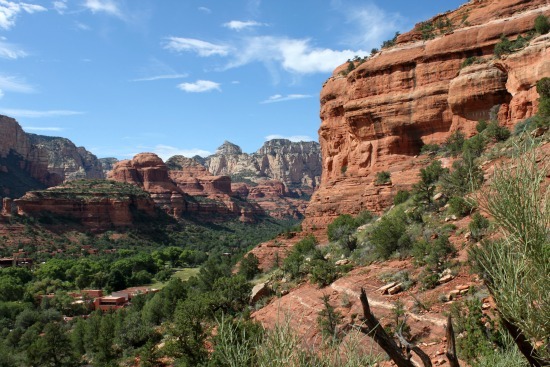 If you’ve never been to Sedona, Arizona – you’re really missing out. It’s a gorgeous little town with a slightly hippie twist. You see, it’s renowned for its four energy vortexes. Wondering what a vortex is? I wondered too the first time we visited. Have you ever seen a dust devil? The swirling and circling of dust and other particulates creates a sort of mini-tornado. An energy vortex is supposed to be just like that except with energy. People travel from all parts of the globe to see and experience them. All four of them are worth the trip for the gorgeous scenery and the possibility of a spiritual experience. 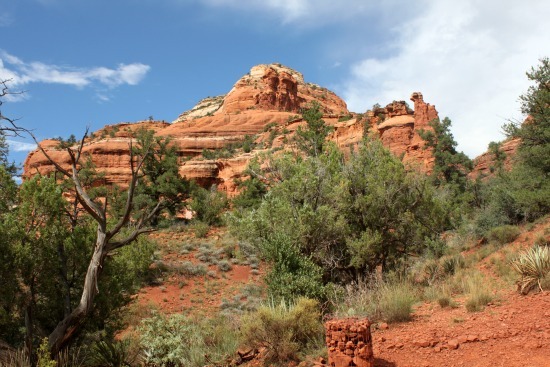 I’m not sure that I’ve ever felt the energy that some folks do, but I sure love trying because Sedona and its surrounding area is one of the most beautiful places I’ve ever experienced. 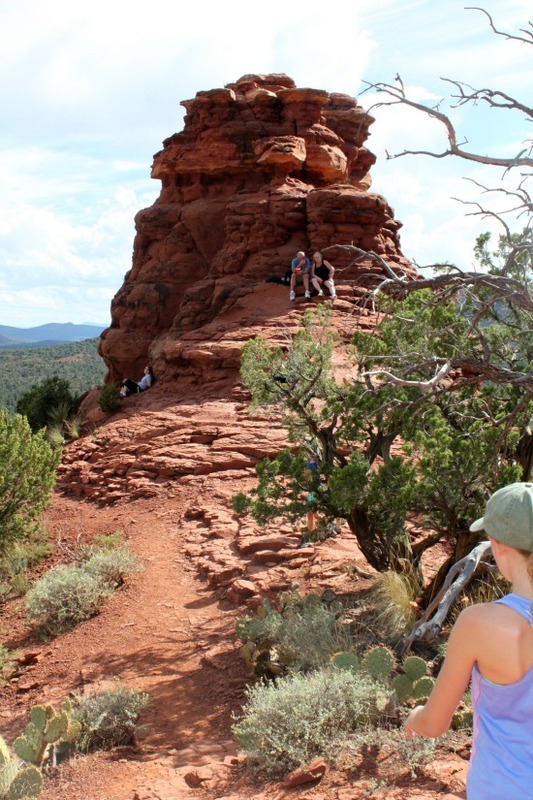 To reach this vortex, you simply park in the Boynton Canyon Trailhead parking lot (day use fees do apply – to find out what type of pass you’ll need I recommend visiting the Red Rock Pass Program page.) There are vault-type toilets available at this paved parking lot. There are no other amenities available so be sure you have enough water with you before you park. Dogs are allowed on these trails, although I’ve never actually seen one on the Vista Trail. We visited in early September so it was still pretty warm outside. I prefer this hike when things have cooled off in the fall or spring. In winter, this area can get snow which makes it even more gorgeous. Once you reach the trail’s end, you’ll want to budget some time to sit and enjoy the scenery or see if you can experience some of the energy. The views from the knoll are absolutely stunning! I’ve heard several different versions of where this vortex is actually located. 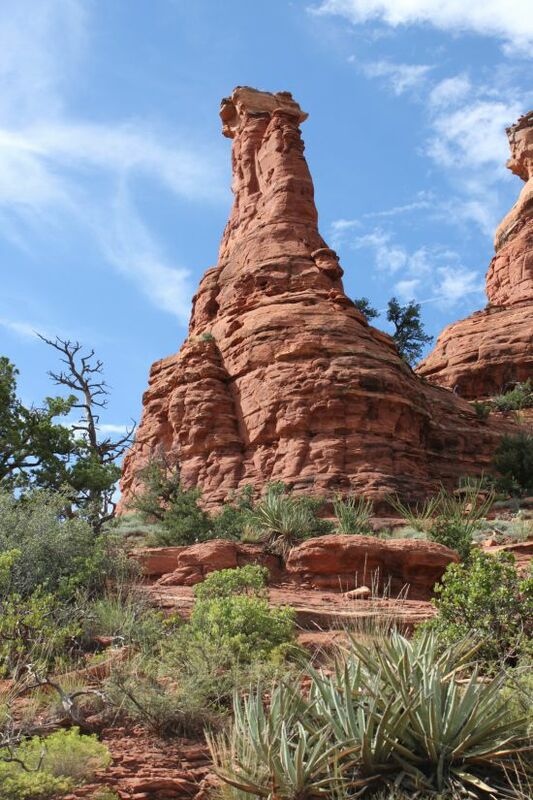 Some say that it’s located in the saddle between the Kachina Woman rock formation and an unnamed knoll (34.544260, -111.505334). Others say it is actually at the top or base of the unnamed knoll. It seems to me that if you get close enough to it and you’re capable of experiencing this type of energy – you’ll feel it. 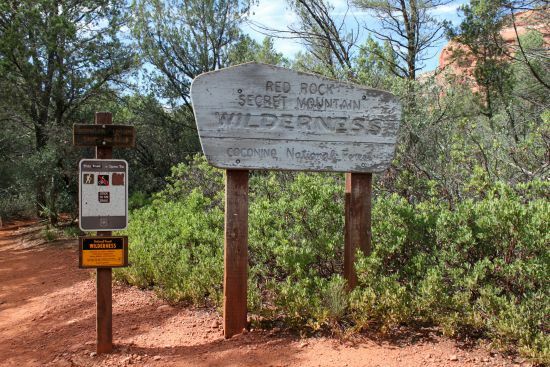 From the parking lot – we followed the signage to the Boynton Canyon Trail. 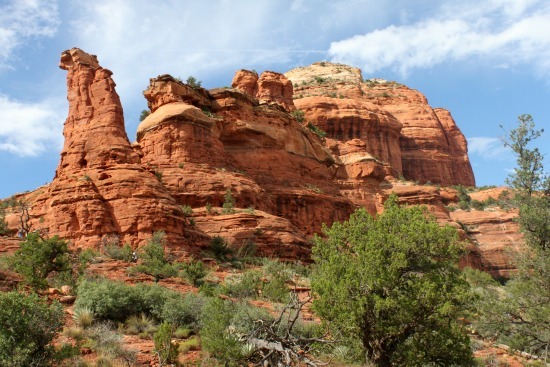 The hike is mostly level and dirt, but nearly immediately you begin to get some glimpses of the red rock formations you’re walking towards. Here’s a sign that made my husband sad because there are no mountain bikes allowed on this trail. Something else to watch for on this trail is the wildlife. There’s abundant insects, lizards, and birds. 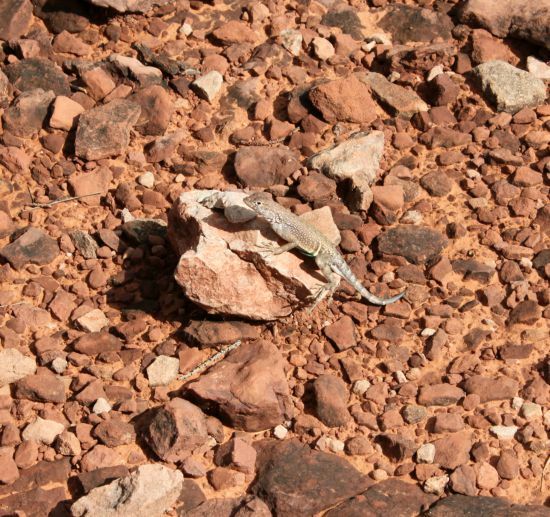 Here’s a Greater Earless Lizard that posed very nicely for us while we took a picture. 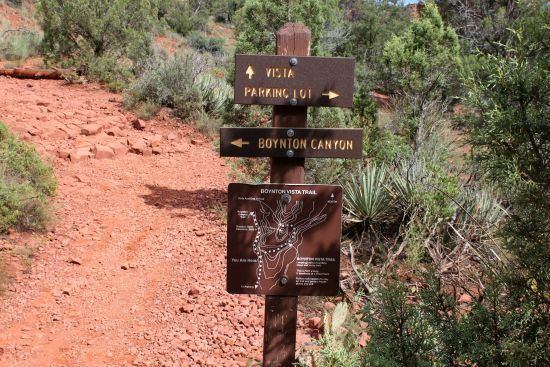 Here’s the point where you leave the Boynton Canyon Trail and start on the Vista Trail. You start to see the backside of the rock formations where the vortex is located within a few steps. 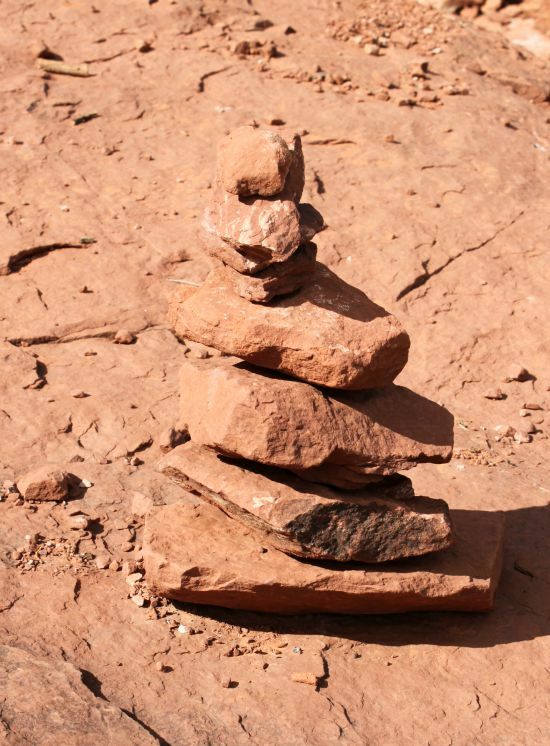 Another thing that you’ll see frequently on this trail is rock cairns that people have left. You’ll see more and more the closer you get to the vortex site. 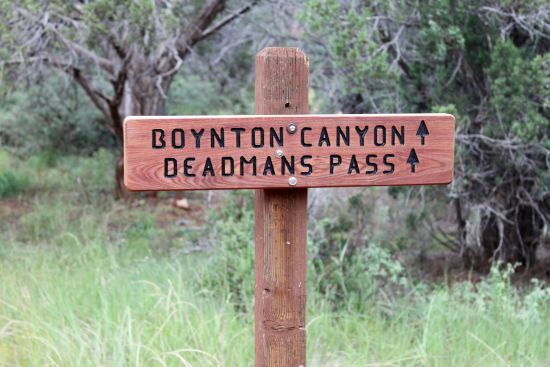 Here’s the end of trail sign that tells you that you’re officially at the Boynton Canyon Vortex site. As you can see – the views are amazing! 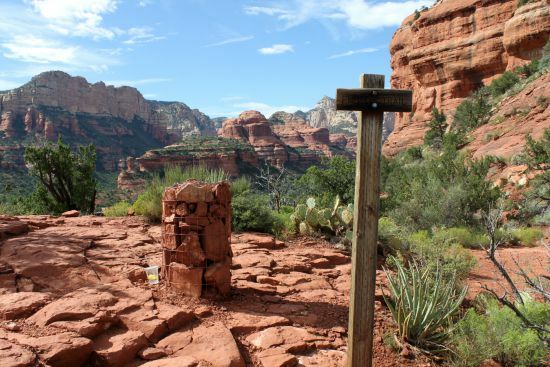 If you’re standing facing the end of trail sign and you turn to the right – you’ll see the Kachina Woman formation. If you turn to the left, you’ll see this unnamed knoll. This is the view from the saddle looking southeast. The knoll is a popular place for climbing (as you can see from the shot below.) Getting to the top of it is a pretty steep climb and best saved for more adventurous climbers. Anyone can find a spot to perch in the shade though. You can also follow a small trail all the way around the knoll. We did just that since the views are amazing from all sides. 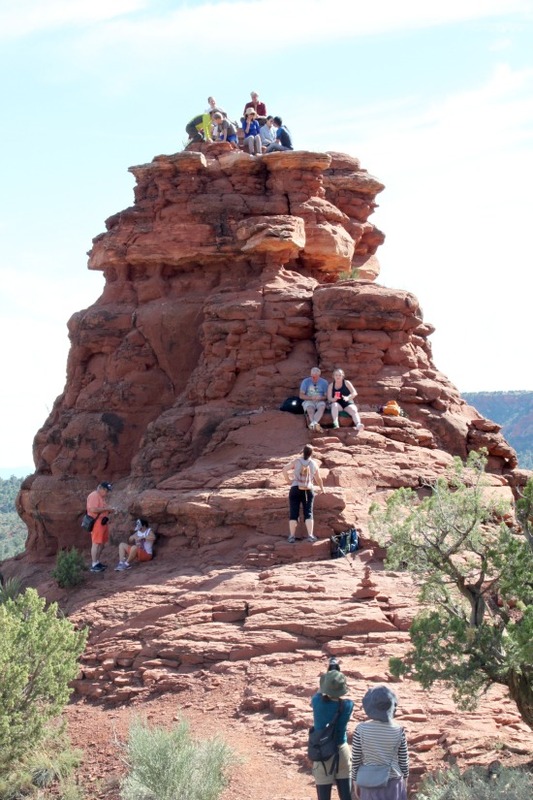 This is a very popular hiking spot so if you’re looking for an opportunity to have some quiet and see if you can feel the vortex energy – I recommend going on a weekday. We visited on a Sunday and this is a pretty typical crowd. I’ve been there on a rainy Monday before and there were only two other people there. 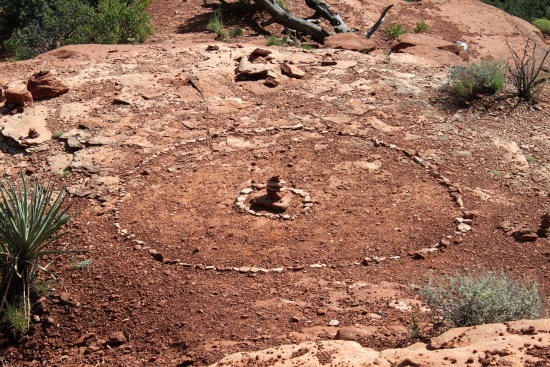 Here’s an energy circle that someone left on a little plateau that is located on the backside of the knoll. You see these frequently near vortex sites. There are some very nice locals who frequent the vortex spots daily and they love to share their experiences. There was a gentleman there the day we visited who was picking up litter, showing folks the easiest way to climb up the knoll, playing a haunting melody on his wooden flute (from the top of the knoll), and handing out heart-shaped red rocks to all who wanted one. His backpack must have weighed a ton. He was very friendly and answered many questions by hikers wondering how they would know what the vortex energy felt like. He described it as a buzzing or a warmth in your body. I attempted to get a video that captured him playing with the scenery…but it’s a little out of focus so I converted it into an mp3 file. This is the audio of the local man playing his flute while standing on top of the knoll while we chilled in the shade underneath it. It definitely added something to the experience. 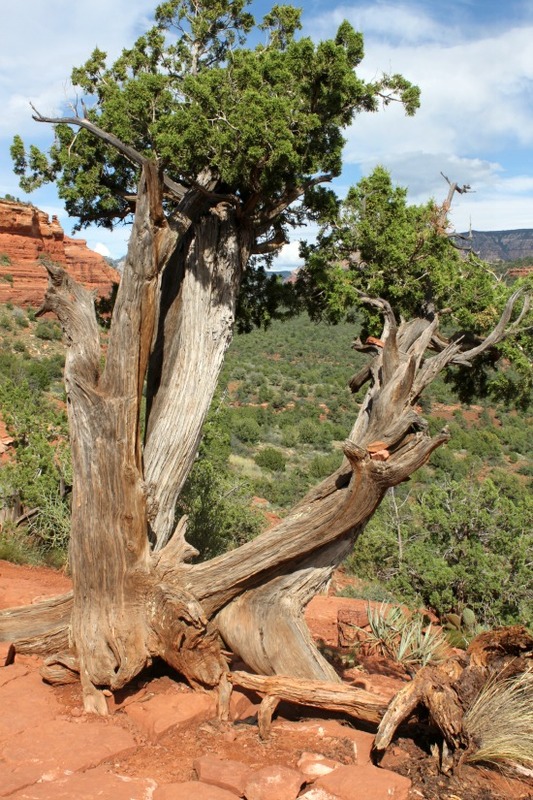 Something else that to look for when you visit a Sedona vortex is the gnarled or twisted Juniper trees. At the vortex sites, they are curlier and seem almost twisted. 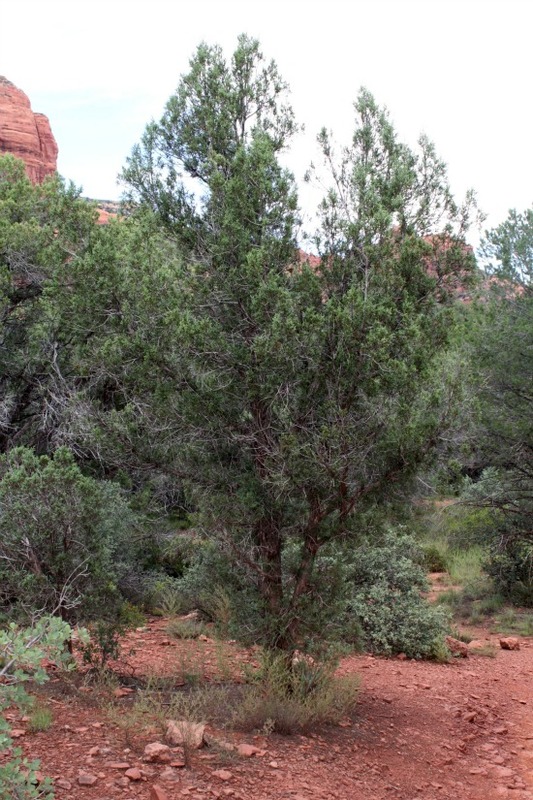 For comparison purposes – here’s a tree from the Boynton Canyon Trail near the beginning of the hike. The tree seems nice and straight. As always – we had a blast on this hike – it’s an absolutely gorgeous way to spend an hour or two! 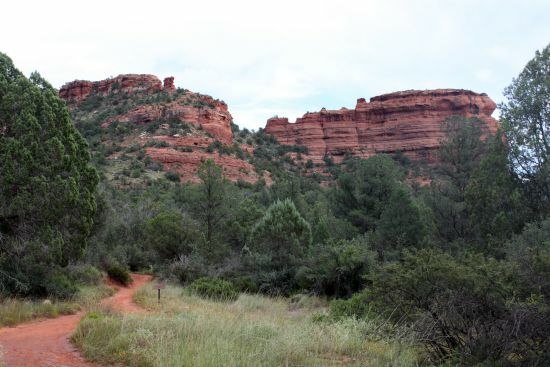 For more information on the Boynton Canyon Trail – please visit the Coconino National Forest website. Thank you for the detailed info! We are planning a trip there soon! You’re so welcome Diana! I hope you all love it there! We visited this vortex in July 2015 and we’re back to do it again this July 2017. Your blog post describes or 2015 visit perfectly! Even the local passing out heart shaped red rocks. 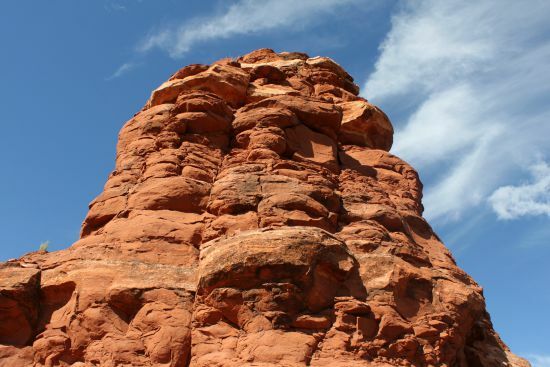 I came across this blog the day after I visited the Boynton Canyon Vortex. I wish I had come across this before I visited, you are very detailed and every photo took me back to this hike. As I started the hike, I could hear the someone playing the flute. It didn’t last very long. And then at the bottom of the vista, our group encountered a very nice man who gave us heart shaped rocks and explained the vortex to us. I believe it was the same man you write about. I hope to come across him again some day and talk to him more. Could someone tell me the name of the trail that leads to the heart shaped hole in the rock? Or even its name? Cool post– I’ve heard of the flute guy in other posts, and enjoyed hearing an actual recording of him! The unnamed formation of masculine energy that you mentioned is Warrior Rock. Robert is the flute player that sits on top of it and hands out the heart rocks. He’s there almost every morning. You may also run across Johnny playing back in the canyon every once in awhile. There’s also a Native that plays as well, but not as often. 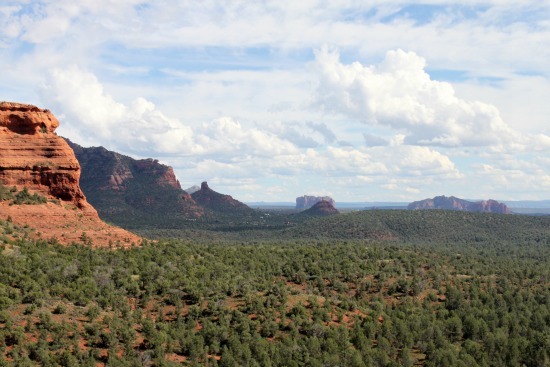 I live in Sedona if anyone has any questions. John, I’m not sure of the heart shaped hole that you’re speaking of. I have hiked up to this vortex more than a dozen times. It is not too strenuous and the views of the valley are fabulous! The name of the man playing his own music on the flute is Robert. 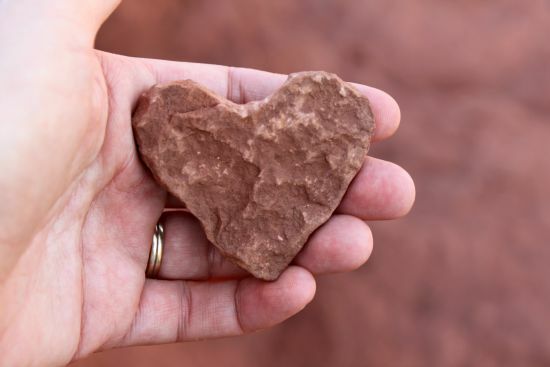 He hands out red rock hearts to each person and asks them to live from the heart, changing how we live in this world. He makes, or assists the rock, into a heart himself. Very dedicated to his mission of helping Mother Earth. The male vortex is called Warrior Rock. He plays atop Warrior and encourages all who wish to join him. He plays around 10:30 each morning and sometimes in the afternoon. Very peaceful experience. Thank you for this post- it’s comprehensive and just what I was wanting to know about this hike. We are headed there soon! Thanks for leaving this detailed post for all to read. It was very helpful on my journey to the Boynton vortex today. I am not much of a hiker so your landmarks and photos were a huge help! 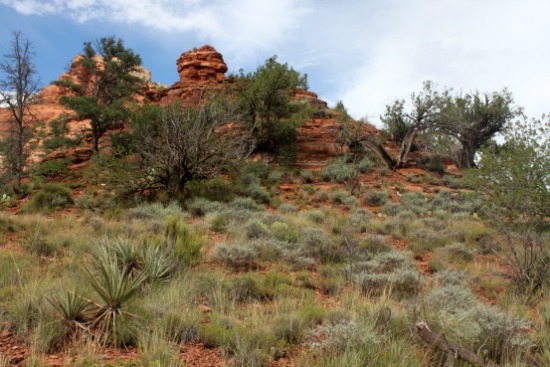 I read this blog just prior to going to Boynton Canyon. I had to let you know as of today, September 21, 2018, Robert, the gentleman you mentioned who plays flute and gives out heart-shaped Love rocks is still there. He said he makes the climb every day! Thanks for sharing this blog! It gives great directions to access the Vortex at Boynton Canyon. 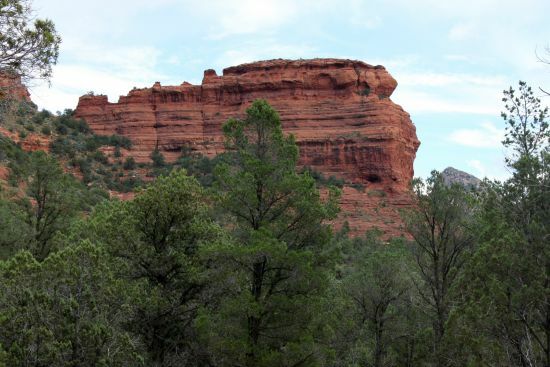 I was at a Technical Roundtable meeting at a resort in Boyton Canyon, Sedona AZ back in 1992. I had not heard of the vortexes then. one morning I went for a hike with a colleague. We climbed straight up the rock face and instead of turning toward where I since discovered there is a known vortex we went left, deeper into the canyon. We were on a plateau with very precipitous drops all around. There was an area where the plateau kind of sheared and dropped about two feet all the way a cross. I will never forget what happened next. I stepped down off the shear drop and I suddenly was overwhelmed with energy. My body was buzzing and I felt like I was being charged up. I climbed back over the dropoff and the energy was gone. I stepped back over the drop and I was in it again. It was like walking through a doorway. It switched on and off in the space of a foot or two. My buddy felt absolutely nothing, but I was going nuts over it. After playing around in it and not understanding what it was we continued onward and had to make a very dangerous climb back down into the canyon to get back before Our meeting for the day started. My buddy was poking fun at me and telling everyone how I “felt this energy”. Someone that worked there overheard and told us about the vortexes. I never had the chance to go back up there, but I will never forget the amazing feeling of being in this vortex. I have searched and I have never seen any description of a vortex at the location I was at. The canyon is known for having a vortex on the same ridge, but near the entrance to the canyon. We were deeper in than any vortex area I have seen posted. If I am ever back in that part of the country I will go there and find that spot again. I know right where it is from the resort. For the record, if you enter the canyon the side we climbed up and hiked was on the right side. When we got up the rocks there was a hole in the rocks to our right and we went left.